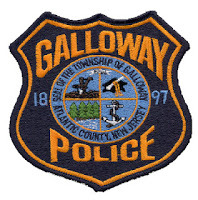 Galloway Township Police responded on September 3, 2013 at 2:12pm, to the 700 Block of S. 7th Avenue for the report of a Burglary in Progress. A female dialed 9-1-1 after a white male attempted to gain access to her residence through an unlocked rear window. The male fled on foot and was later apprehended by Patrol units while fleeing from a 2nd residence he burglarized on the 300 block of E. Arbutus. Kurt F. Moyer was charged with Burglary, Theft, Criminal Attempt @ Burglary and Resisting Arrest. Moyer was lodged in the Atlantic County Jail Facility in lieu of $65,000.00 cash bail. All property stolen by Moyer from the 300 block of E. Arbutus was recovered by the responding officers and returned to the homeowner. Officer James Mulholland and Captain Christopher Doyle were the arresting Officers.